I second what you say at the end of your article Iqbal. 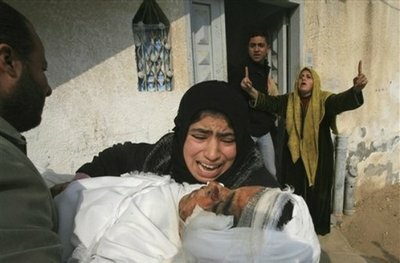 I remembered this photograph of a beautiful Palestinian mother with her surviving little one in the horror of Cast Lead. I cannot find another one of her with her dead child where her expression was most tender. I too tried googling ‘arab mother child’ and got very few hits, as you did. But then I I googled ‘Balosha family’ as a result of Mary’s link, and got 109 hits (most of them repeats of just a few photos). I also googled ‘polish mother child’ and got only one photo. So I don’t think it so sinister as it may appear. Google can only find its images from picture captions and local context, so if the combination ‘arab mother child’ is missing from those, it just can’t find them. You missed the point Richard, it is about searching the general term ‘Mother and Child’ regardless of knowing their country or background….the outcome has no results of Arab or Palestinian mother and child photos, even though this part of the world shows one of the highest incidents regarding Mother and child subjects having in mind the many attacks on Lebanon that recorded mass killings and witnessed Sabra and Chatella massacre, Palestine which shows on daily bases recorded incidents of children and their mothers….Gaza was just one of those examples that have happened few weeks ago, Iraq which suffered occupation and many mother and child concerns since USA lead invasion, besides other countries like Sudan for example. The Arab world is a very big area with great interest; otherwise all those invasions would not have happened. Hence it makes sense to expect more than a photo or two when searching in general. In 2000, the Middle East’s population was 349 million. Seriously…all those can’t be represented in a photo or two???? From hear in the UK, I got seemingly uncensored image results using the terms ”mother and child’ (general pics, as you might expect with the general term), ‘palestinian mother and child’ (857000 hits, the first page showing IDF pointing automatic weapons at children, death, despair and the like). I used the terms without the quotes used hear, as using quotation marks in google and most other search engines indicates “exact match” requirement. Can’t try in arabic as I am not an Arab. It is entirely possible that Israel is filtering and/or has arrangements with Google, much like China. I just want to say your article was very good and honest. I pray for all the mothers in the world and especially for those who are suffering because of the ignorance of others.